Our favorite movie quote is "These mashed potatoes are creamy" from While You Were Sleeping. I didn't play this week, but loved your answers. When the colors are presented, especially by a school group ROTC, I get weepy...and my inlaws are the best! Loved your answers. And I'm surprised how many different people said their in laws knew they were "the one". I love that your father in law recognized that you were meant for his son. That just touched my heart. I am curious about your dad...did he answer questions for you that you may have had about war/ the military or was if OFF LIMITS to dicuss? I am such a "questioner", I love information, hearing stories getting to heart of ones beliefs. My dad didn't talk about anything, I remember asking him "Dad what was it like growing up? What did you do? Play? Like?" All he said was "I almosted died from menengitis." Fall is the best! I didn't do the random this week, but I'd have had to list more than one activity too -- so much to do this time of year! I am with you on the National Anthem...gets me every time. Love your movie quotes, we say the Tommy Boy one all the time too!! And yes the nice surprise question should have been written for you. Good answers, Joyce. I can tell that you are a patriot, for sure! I tried to comment on your birthday posts, but couldn't get things to work for me. I gave up after 3 tries. Hope this one goes through. Your b'day sounded wonderful. Your hubby did good! I agree with you about the bunks on the aircraft carrier--too much like coffins. I'm claustrophic, so I skipped the submarine tour. We went on a tour in Charleston, SC a few years ago. I couldn't pick just one favorite quote either. Love your answers. Especially about waking in the night. I thought I was the only one who wrote their blog in the middle of the night in their head! We quote Napoleon Dynamite all the time....love it...I don't even think my youngest know the correct pronunciation of "quesadil-la"....loved reading your answers and am happy there is another jeans and heels girl in the crowd....btw, I want a birthday just like yours!! You must be so proud of your dad. So many medals and awards! It´s always good to read about who have a good relationship with the in laws. Loved reading about your dad. I love your answers and love getting to know you better. Have a great week. 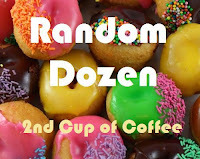 If I get time this afternoon, I just think I might have to participate in this Random Dozen. I actually think I have answers and even some pictures to go with them. Love your answers, but then I always do. You just have a great way with words. You must be very proud of your Dad. Enjoyed reading all of your answers. Parents weekend will be awesome. I admire Marines out of all the military branches because they are so tough! (But I'm glad my sons decided to go Army.) Any time I see someone in their military uniform, I get tears in my eyes and my heart swells! Loved your quotes. For a few years, I heard "There's no crying in baseball," from "A League of Their Own"--one of my favorite movies.